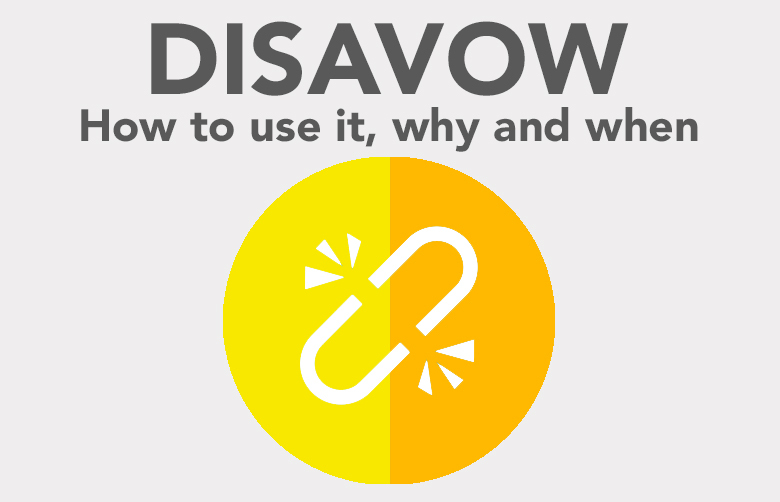 If you are involved with running a website, chances are you’ll have heard the term ‘disavow’ – but what is a link disavow? How do you disavow links? And why would you need to know? Why would I need to disavow? One of the many ways Google judges a page and where it should appear within search results, is by looking at the incoming links from other websites. If a high authority and well-trusted site (such as the New York Times, the BBC or Microsoft) links to your page, Google reads this is an indication of good quality. The more of these links your site has, the better. It also works the other way around. If your page has a high number of links that violate Google’s quality guidelines, then Google will see this a negative indicator. If you have lots of links from pages with little or no original content, pages hosting malware or those participating in link schemes, for example, this could lead to ranking lower for relevant key terms. In some instances, Google may even impose a manual penalty on your site, dropping your rankings across the board. Why would such links be there? They could have been made with best intentions, as part of old school SEO practices that are now frowned upon or from a site which has dropped in quality since. Or maybe you’re unlucky enough to have a competitor that’s indulging in ‘black hat’ techniques, and has built the bad links on purpose with the intention of harming Google’s view of your site and potentially boosting their own. If you believe such links may be present on your site, you must quickly work to stop them from affecting your rankings. Where possible, you should try and get the links removed from the internet altogether – doing it yourself if you can. If you can’t, you could get in touch with those behind the linking sites and ask for their removal. However, it’s very likely that you won’t be able to get in touch with those responsible for all the bad links, either due to not being able to find any contact details or them not replying. That’s where link disavows come in. Google provides a disavow tool as part of Search Console, This can be used to ensure specified links are no longer considered when your site is being assessed. Simply compile a correctly formatted list of the domains and URLs you feel are negatively affecting your site – called a disavow file – and submit to Google via the tool. After it has been processed (normally within a few weeks), these links will no longer have any impact on your search rankings. Again, though, this works both ways. If you accidentally include good quality links within the disavow file that have been positively influencing your rankings, then once the file is processed, this positive impact will be gone too. As such, a high level of care and caution should be used when making use of the tool… you could end up doing more harm than good. How do I produce a disavow file? First, it’s necessary to get a complete list of links pointing to your site – or as complete as you can get. At Further, we use many services such as CognitiveSEO, Ahrefs and Google Search Console, and combine and de-duplicate their output to ensure as many links as possible are there to be looked at. Once the list is complete, some elements can then be quickly reviewed against what is already known, for example: picking out the obvious good or bad links and marking them appropriately. While the benefit of links from the likes of bbc.co.uk and microsoft.com should be obvious keepers to all, Further’s extensive experience of producing disavows for many clients allows us to check links against our assessments from previous projects. The remaining linking domains should be manually checked, looking for areas where Google’s guidelines are broken and the potential for a negative impact is high. This can be time consuming for larger sites with a high number of links, but ensures that only detrimental links are removed. Once the classification is complete, a disavow file is produced and formatted to meet Google’s conventions. This is then submitted via the disavow tool. As you can imagine, manually producing a disavow file can be quite an intensive process – especially if you have a large site with a high number of external links. To help with this, there are several tools and services that can help automate the process, such as Kerboo. These can automatically classify a good proportion of bad links without too much user effort being required, as well as simplifying the process of sorting through the rest. Such tools can prove expensive. Additionally, the more automatic the classification process, the more likely useful and valuable links could inadvertently be disavowed. Something that gets incorrectly flagged by a tool as ‘bad’ could easily make its way into the disavow file if it isn’t manually checked. At Further, we’ve helped a great number of our clients with disavows – improving rankings and reversing Google-imposed penalties for many websites along the way. If you want us to take a look at your link profile and see what we can do for you, don’t hesitate to get in touch. If you enjoyed this article, you might like: 5 data analysis tools for understanding your digital marketing campaigns. This is very helpful. Thanks for sharing Matthew! :) How often do you update your disavow file? It's a bit of an awkward answer, but it depends on your site status and how much bad links are an issue to your site. If it's a smaller site and there's only a few when you first check, then doing it too regularly is likely to waste time that could be better invested elsewhere. However, if you're a big company with millions of backlinks, then regularly monitoring the situation every few months is a good idea. The main thing to know is that there aren’t really any pressing reasons to hold off from using the tool if you're aware of bad links that you can't remove yourselves. If you've spotted some that you need to get rid of at any point, add them to your disavow list and upload it again. I see. Thanks Matthew for responding! :) Helps a lot. Google's search console disavow tool really helps to remove the spammy backlinks that can hurt websites ranking. A routine check for such bad links and removing them by updating the disavow file will help to maintain the authority of the website. Thanks for sharing such great information.